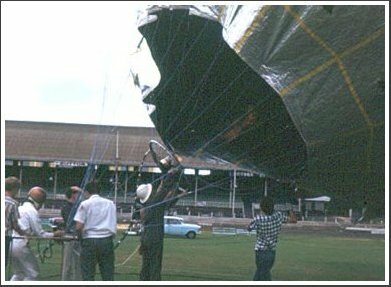 Here, at Sydney's Royal Agricultural Society's Showground (now Fox Studios) the "re-made" Aerostat Society arrive early morning for testing the newly built "EGO"
The balloon envelope, being made of stiff polyester film could never lay out flat like a woven fabric. 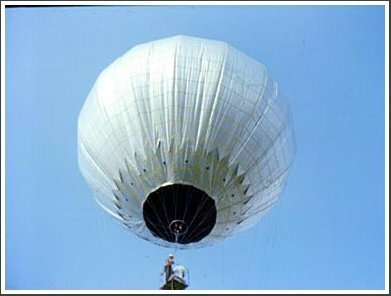 As with "Teijin", we would attach the balloon to the 20 ton water tanker before a flight. The large yellow tube connects to the ground blower. This provided warm air to initially fill the envelope. Our very first test Flight was close to being a disaster. The wind was light, so we decided to simply inflate the envelope with cold air and check the rigging. 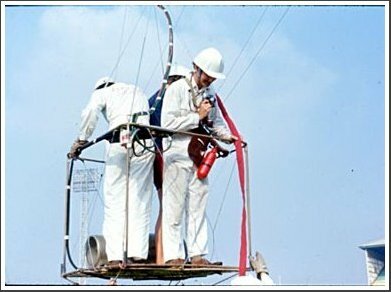 With no burner or gondola attached, we let the balloon drag us along a little. We then pulled the cap out but trangely, it made no difference. Even now, with an 18ft diameter hole at the top, it kept going, dragging all six of us. Finally it crashed against some light poles and split open. Pat Wilson,Garry Smith, Ted Lee (student) , Grahame Wilson. Pat Wilson & Ros Breillat hold the crown down as long as possible during an inflation test. 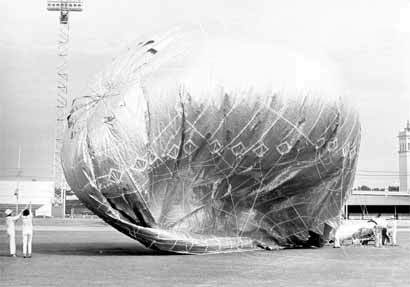 A row of 32 patches were the tether points for the balloon. We decided not to tether to the basket, as had been done with Teijin. Looking up into the mouth of the filling balloon. The 18ft diameter closed cap can be seen at the very top. The thin meandering lines are repairs, resulting from the cold air trial mentioned . 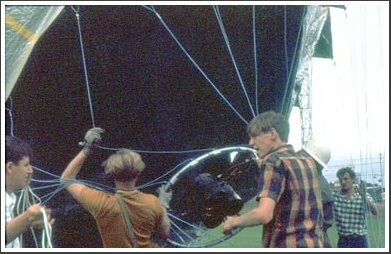 The main rigging from the balloon led down to a single shackle. This shackle was lashed by a rope to two intersecting steel posts driven into the ground. (obscured here). 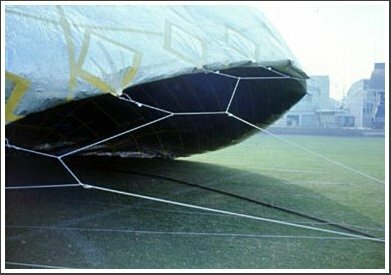 At this point during inflation, the main harness is still shackled to the ground. 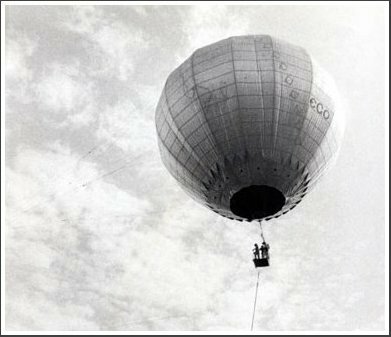 When the balloon had enough lift, the rope lashing to the shackle was cut, and the gondola was pulled upright. The balloon needed to be quick and simple to launch. 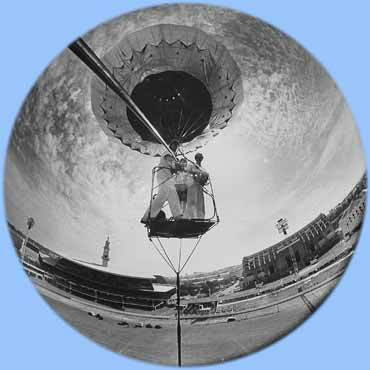 Unlike regular balloons, the burner was not attached to the gondola. It had its own suspension harness. 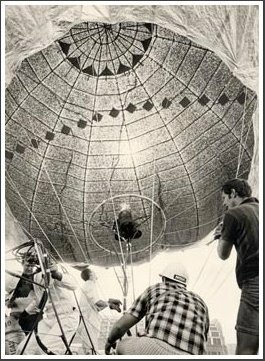 As the balloon swayed about in the wind, the single point suspension evened out the stresses on the balloon, and required little effort from the crew. The burner and its' flame swayed with the balloon. This meant the flame always pointed into the balloon mouth. Our new burner can be seen here mounted into a load ring scavenged from the Teijin wreck. It was relatively easy to build three copies of Archimedes burner, and mount the trio. In theory, it delivered 3,000 Horsepower. Alan Powell, Keith Wilcox, Robert Lee (student), Garry Smith. Early morning is always the best time for launching. The air is usually calm and cool. Garry Smith beside the red tape which marked the chimney release line. Three green hoses lead propane gas up to the 3 barrelled burner. An electric ignition line was included in the bundle. To Garry's right, is a triangular control panel. It has an induction coil, gas valves, an altimeter, and a rate of climb indicator. The view from below. 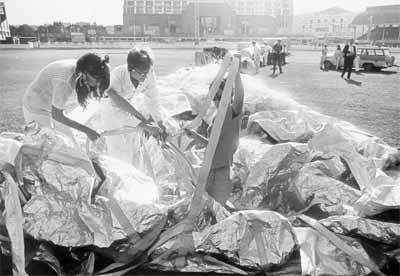 The floor of the gondola was a sheet of aircraft aluminium, laced with steel cable to the steel tubing frame. The flickering flames of the pilot light can be seen in the burner. The burner had its own support harness which came from the triangular flaps on the outside of the envelope. The 18 ft cap was not a perfect fit - hence the tiny gaps around it's edge. Ross Breillat and Gary Smith were largely responsible for bringing some life and fun to those of us who took all this far too seriously. The propane tank held 40 lbs - enough fuel for about an hour. EGO flying above the Sydney Showground. There is a reasonable wind here. The wind stress pulled the fabric tight on the downwind side, and created folds on the upwind side. This view shows the tether system. The lines can just be seen faintly on the far left leading to the water tanker. 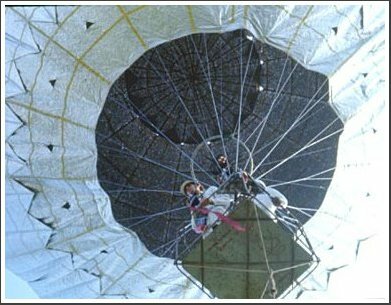 The balloon remained upright even in fairly high winds, putting no extra load on the gondola. We had hoped to later fill in the open mouth and slightly pressurise the balloon, hence the small triangular holes visible near the mouth intended as air exits. These pictures were taken by George Lipman, a "Herald" photographer, who is holding a steel pole. On the end is a camera with a fish-eye lens. Pat Wilson and I share the gondola. 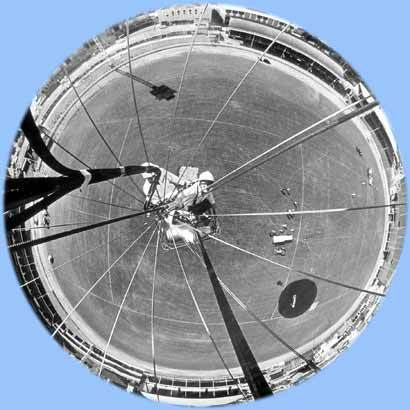 About 200 ft below is the main arena of the old Sydney Showground and the balloon's shadow. The taped gas hoses wind their way up to the burner which is out of sight above the camera. We used a heavy 200ft drag rope. 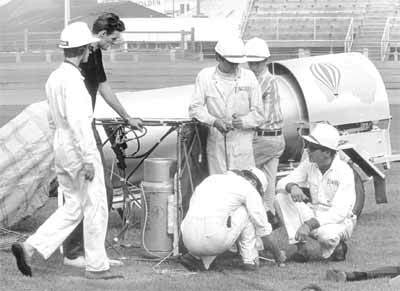 This provided easy control for the ground crew. The "see through" gondola was popular with show audiences. The radiating lines are steel support cables which all center on a main shackle. Our lives depended on it. It could take 4.5 ton. 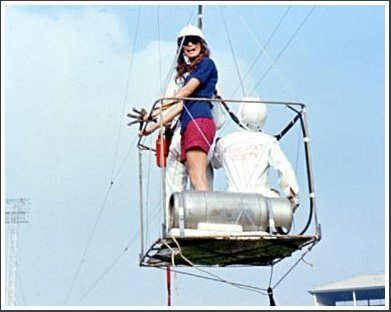 Because the gondola was suspended from this single point, any crew movements did cause it to rock more than a conventional gondola set-up. The 20 ton water tanker which kept us from blowing away. Teijin could lift the tanker, unless it was full. The tether system for EGO divided in two, then 4, 8, 16 and finally 32. There were pulleys at each division so that the tensions remained equal as the main tether line became steeper. 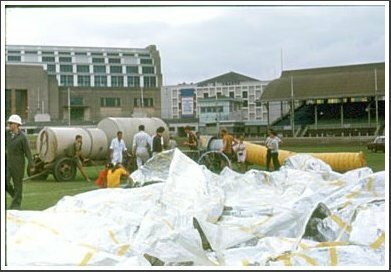 There were always a few folds in the envelope, had it been pressurised, these may have disappeared. EGO was 56 ft in diameter and 65 ft high. Its volume 82,500 cubic feet. The envelope weighed 200 lbs. EGO's size was determined simply by the amount of polyester film we had been given. 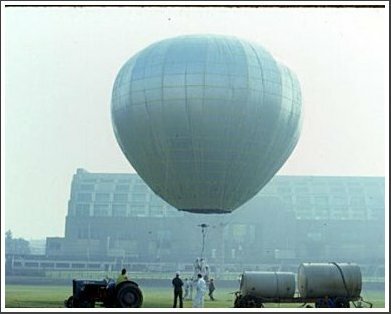 Although the balloon retained heat very well, It was not a practical material. As the envelope slowly deflates, we get a good view of the tethering system. 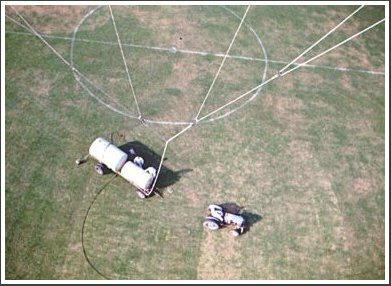 When we built the balloon, we made a dummy tether patch and tested it with a one hundred pound (45 kilo) load. It worked well, which meant that in theory the envelope could handle 3,200 lbs (1,450 kilos) . Notice that there are linking lines to even out the pulling direction on each tangential tether. The 18ft cap in operation. There were 16 thin break threads,( the type used for static line jumps in parachuting) These held the cap in place. A rope simply pulled the centre down, breaking the threads. A light line prevented it falling into the burner. It worked well except for it's very first puzzling test when the balloon was full of cold air yet refused to deflate.